Wedding day logistics… not the most glamorous part of planning but my are they important! Now I like to think I’m a fairly logical guy (my friends may disagree), I like to fixate in on the logistics to ensure a wedding day runs as smoothly as possible. It’s all the little cogs that makes a wedding day tick along as it should. It is these little logistical elements that I just want to run through today, because before working at Matthew Oliver Weddings I wouldn’t have thought of these, so maybe you haven’t either? (Though if you have you’re doing alright!). First off is transport logistics… now I wrote a blog on this last year (which obviously you’ve read 😉 ) so I’m not going to go over it again. Though if you happened to be washing your hair the week it was published or should wish to refresh your memory, have a gander here. Signing the register… usually for all but a humanist ceremony a register of some sort needs to be signed at some point during the nuptials. This tends to only involve a few members of the wedding party and can take some time, so instead of leaving the congregation in an awkward silence, broken only by sporadic mutterings, give them some entertainment. If in a church maybe the choir can belt out a little rendition of ‘All you need is love’ (White Lilac did this at their wedding and it was awesome!) Maybe you have a particularly talented friend, who you can coerce into performing for the amusement of your guests… it really can be anything, but really something is needed as it removes any disjointedness from the whole proceedings. Drinks/canapés Vs drinks reception time… if your guests are lucky enough to have friends (that’s you) put on a drinks reception for them, you want to do it well. Look at the logistics for the amount of drinks and alcohol needed to appropriately last the drinks reception time. This may require subtly scrutinising your friends and families drinking habits in advance, to get a feel for whether they are a particularly alcoholic bunch! However a good rough guideline for drinks is around one glass every 20 minutes, though this will slow down as the drinks reception progresses. For the canapés roughly 5/6 per person over an hour, though ideally these need to be spaced out over the hour. A great tip if you want to make sure there is plenty of dancing time (and the schedule of the day allows for it) is to have the canapés as the wedding breakfast starter! Genius! Speeches!.. these can fill people with both dread and excitement, the ‘in jokes’ and adventurous puns aren’t for everyone, but I always make sure I’m around for the speeches. Recently I wrote a blog on timings of speeches (again I’m expecting you to have read this! :P) though if you haven’t I shall let you off and point you in the right direction… (read it here). Further to the timings logistics however is the physical logistics. Where are people going to be standing for their speech, can they be seen? Can they be heard? Will there be a mic? Do they know where it is and how it works? These are essential questions which need to be answered in advance to make sure there is no awkward silences of nervous laughter (I think you may have guessed I hate awkward moments at weddings!). Shoes… simple one really… look at the ground of both your ceremony and reception. Can any types of shoe walk across the ground, yes? Great news! Though if not, tell your guests… Stilettos and grass usually causes all the drama! As I said before I am currently flying back from Italy as I write this and my was it hot! (even in September!) Amalfi is renowned for it’s wonderful weather and it’s many, many, many steps… I mean my legs have never worked so hard in their life! But as well as it’s many, many upsides it does have a down, with the hot weather and the many, many, many steps, someone in a full on tweed suit or thickly layered gown is not going to last long before collapsing in a sweaty heap. This can be said for any wedding in any part of the world, if it’s really cold, let you guests know, if it’s on windy hill, let you guests know or if it is an exceedingly warm climate, just let your guests know. All you need to do is advise a dress code on the invite and it should save any bedraggled grumpy guests on the day. Signage and lighting… take good look around your venue, both in the day and at night. You want to see your venue in all it’s shining and moonlit glory, as your day is likely to start during daylight and go onto when it is dark, which will show the venue in two completely different lights (or not as the case maybe!). Put yourselves in the (possibly drunken) mindset of your guests… can you find your way around easy enough without asking, are there dark areas where you can’t really see that step you just stubbed your toe on? If you get lost or injure yourselves then at least one of your guests are bound to! 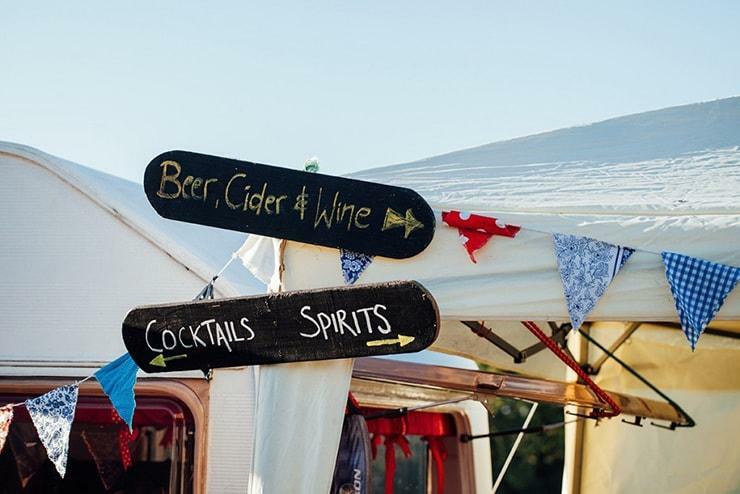 Help them out by putting out signs pointing them in the right direction and lighting areas which need it, this can be done simply with chalk boards and lanterns, but custom signs and festoon lighting are some great options too! Finally, as I know I have a tendency to talk too much(! ), I just want to ask you to lend a thought to how the logistics of the day will work if it is raining… (assuming elements of your wedding are outside). You need to look at the wet weather continuum and all the logistics specific too it. We all hope for perfect weather, but you need to be prepared if unfortunately that perfect weather fails to materialise (this is especially prudent for those of you getting married in the UK!). I hope some of this has been useful to you, there are soo many more logistics that go into planning a wedding day and the days around it, but I get told off if I write too much and my flight is currently descending into London (hurrah!)! So the above is all you’re getting for now! Have a wonderful weekend with whatever you maybe doing and I hope to hear from you soon!